Gulf Oil Spill and Obama: "It’s 3:00 AM!" If it were up to me, I would focus on stopping the source of the oil spill in the Gulf of Mexico. The Obama Administration is all fired up about investigating the ’cause’ of the leak. BP is all giddy about siphoning off a third of the amount of oil still gushing into the gulf. Congress is all wound up about having endless hours of meetings and testimony about who (since the government is effectively broke) is going to pay for the damage. Meanwhile, the hemorrhage continues. Why not stop the source of the leak first, then focus on the massive cleanup? Decision makers make decisions and then stand by them. An ‘organizer-in-chief’ like Obama can only excogitate ways to extort money out of BP. Obama is going to get to the bottom of how this happened and his administration is going to look for a neck to place its boot on. Yeah, right. Sounds like the work of a community organizer, not a president. A real president would focus on stopping the flow and then cleaning up the damage. Meanwhile, BP has figured out how to make money by syphoning off some of that crude. Why not syphon off as much as you can while you’re drilling that relief well? For BP it’s about recouping some of the losses, not really about stopping the leak. And Congress? Congress can’t even take the time to read a bill before they vote on it. What is Congress going to do to stop a real crisis? Nothing. Passing Obamacare was some kind of National emergency, but the destruction of the Gulf Coast is not a big deal. If a water main breaks in my front yard, the solution is not to point fingers, run my mouth, or to see how much water I can syphon off. The solution is to stop the leak. How do you stop a mile deep oil gusher? Explosives. You blow it up. What technology might the Federal Government have in its vast arsenal capable of sealing the breach? I would to God that someone in the Federal Government or Military would have the stones to seal the well and stop playing games. Cap the @&%# well head. Has the well been capped yet? 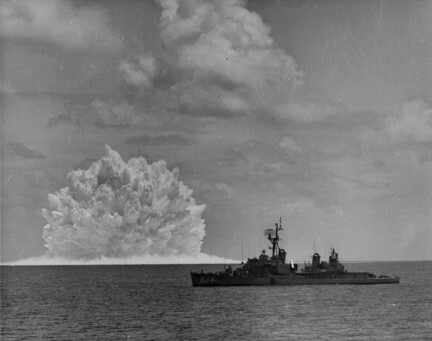 Could nuclear bomb be answer for huge leak at US Gulf coast?